This is a sentimental meal for me. 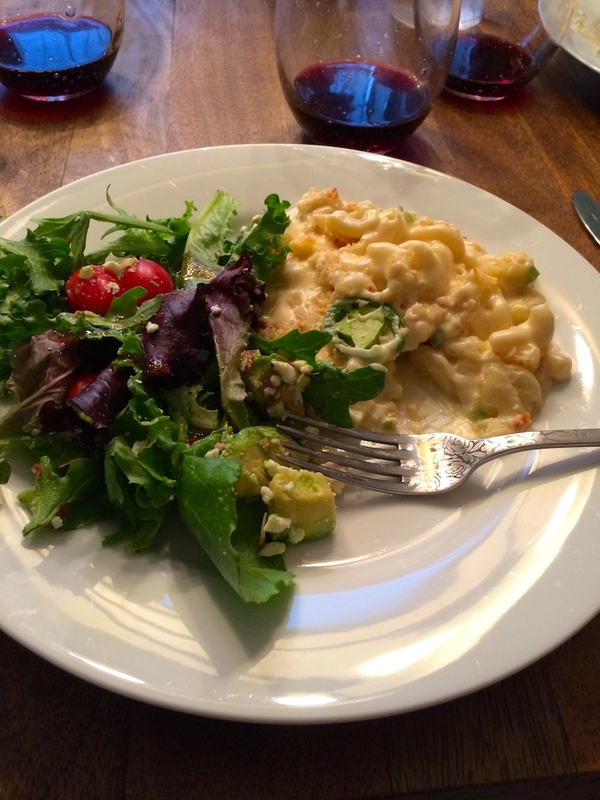 Not only because homemade mac and cheese makes me shed a tear of happiness, but because it’s the last meal I made and shared with my best friends before I left San Diego for New York. I really wanted to cook for my favorites on my last night — it’s a tradition for me to host the girls for dinner and usually a bit of horrible reality TV. So I busted this favorite out for my last night before I left for the East Coast. I’ve shared this mac and cheese book with you before, but let me just reiterate how great (and dangerous) it is. They get the base béchamel sauce down, and you can’t go wrong from there. This version is a spicy, delicious variation on the classic. Mix some diced up jalapeno peppers into this cheesy cheddar and cream cheese combo — yum. The first time I made it, we were scrambling for the last serving. This time I learned my lesson and made a double batch. Have some extra sliced peppers on hand for people who like it spicy. Eat with people you love, because you’ll be fighting for the last bite. Cook the pasta in salted boiling water until a little less than al dente. Drain, rinse the pasta with cold water, and drain again. Add the sauce (remember only two cups! ), cheese and chiles to a large, heavy-bottomed pot and cook over medium heat until the cheese is barely melted, about 3 minutes. Turn off the heat and add the cooked pasta. Take a taste to check the potency of the chiles–jalapeños can vary in their heat, depending on the batch and the season, so you may want to add more to increase the fire. Pour the cheesy noodle mixture into a large baking dish. 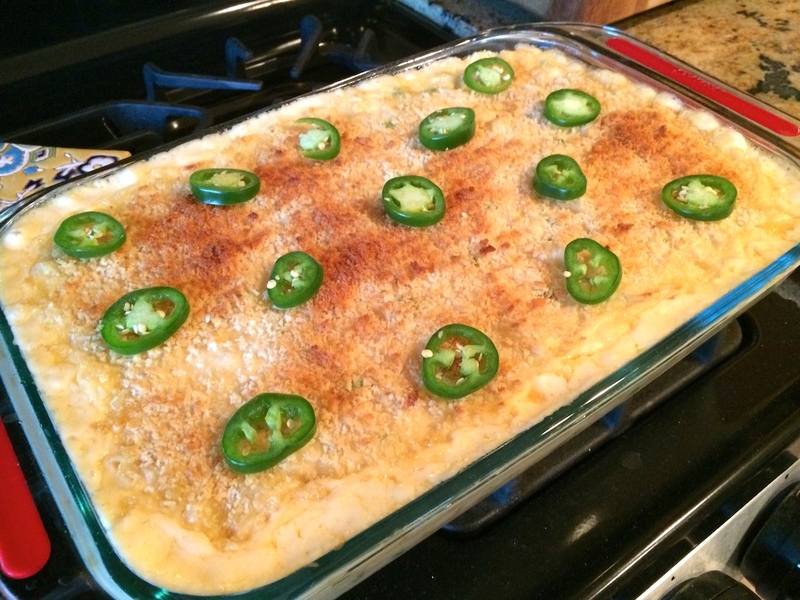 Top evenly with panko and bake until you see the cheese sauce bubbling up the sides, 10 to 15 minutes. Spoon into bowls and serve immediately. Sprinkle a few extra jalapeño bits on top for an extra kick. Heat the milk in a pot over medium heat until it just starts to bubble, but is not boiling, 3 to 4 minutes. Remove from heat. Heat the butter over medium heat in a separate, heavy-bottomed pot. When the butter has just melted, add the four and whisk constantly until the mixture turns light brown, about 3 minutes. Remove from the heat. Once all the milk has been added, set the pot back over medium-high heat, and continue to whisk constantly. In the next 2 to 3 minutes, the sauce should come together and become silky and thick. Add the salt. The mac sauce is ready to use immediately and does not need to cool. Store it in the fridge for a day or two if you want to make it ahead of time. It will get a lot thicker when put in the fridge, so it may need a little milk to thin it out a bit when it comes time to melt in the cheese. Try melting the cheese into the sauce first and if it is too thick then add milk as needed. Catfish is one of those fish that gets a bad rap because of its scary name. It makes you envision the fish, alive. No one really wants to do that. And the whiskers. Oh, the whiskers. But it’s actually a really delicious, mild white fish that’s versatile and affordable. Many recipes call for frying it, but this one pan-sears it, giving it a nice crust. I made this for my girlfriends Shahnaz and Linnea on Monday night for my guilty pleasure — watching the Bachelor. Let’s be honest. This was risky, since Shahnaz is not a seafood eater. But I crossed my fingers and went for it. And I couldn’t have been more surprised when she liked it and even had seconds. If that’s not endorsement, I don’t know what is. The gratin is really interesting. The tomatillos add a whole new layer of flavor to the parsnips and potatoes, along with the smoky cheese. I couldn’t find smoked mozzarella so I used a mixture of smoked provolone and smoked gouda — I don’t think it melted as creamy as the mozzarella would have, but it was still good. It makes a lot, so you could probably cut it in half and still get 4-5 servings from it. Together, it was a delicious meal. Yum! 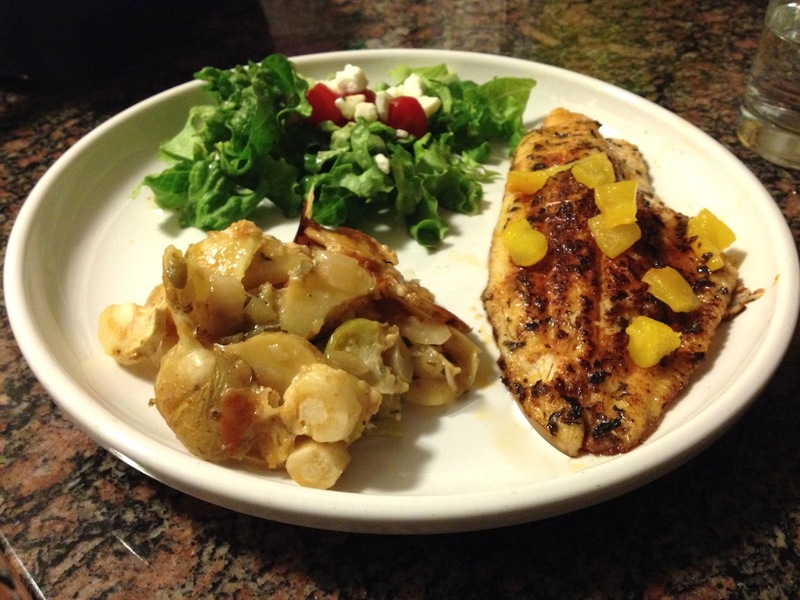 The spice mixture makes a small amount — enough for a very thin layer of spice on the fish, which was perfect. But go easy and don’t put too much on the first couple fillets you season, so you have enough to cover all of them. To give you an idea of how this worked for me — the 1 3/4 pounds of fish came to five fillets — but this will depend on how big the fillets are. When you’re pan searing, don’t move the fish around. Let it sit there for the 3-4 minutes without moving the thing (seriously, put down the spatula). Then flip it and don’t touch it until you remove from the pan. Follow the times they give you here when you’re cooking the fish. It can be hard to tell when the fish is done by just eyeing it, and overcooked fish is just bad. I served this with a green salad. You can make the roasted yellow pepper ahead of time, slice and store in the fridge. To make gratin, in a large saute pan or skillet over medium-high heat, heat oil. Add onions, garlic, tomatillos, jalapeños and herbs and saute for 8 to 10 minutes. Add wine, cover and simmer for 3 to 4 minutes. Preheat oven to 375F. In a large, 9-by-13 inch rectangular, lightly oiled Pyrex baking dish, place a thin layer of tomatillo mixture on bottom (1/2 of total). Then place a layer of rutabagas (1/2 of the pile you have) on top, followed by a layer of cheese and then a layer of potatoes (again, half of what you’ve sliced). Repeat sequence again and top with a sprinkling of cheese. Put in the oven and bake for 45 minutes. Cover and continue cooking for 10 minutes more. Remove and let rest, covered, for 8 to 10 minutes before serving. Meanwhile, combine paprika, herbs, cayenne, salt and black pepper in a small bowl and mix thoroughly. Rub onto catfish on both sides. In a large saute pan or skillet over high heat, melt butter. Add catfish and quickly sear for 3 to 4 minutes. Turn and continue searing for 2 to 3 minutes, or until done. Remove from pan and place on plates. Place squares of gratin on the side. Garnish with chopped roasted yellow pepper. As usual, I spent my Christmas in New Hampshire in the house I grew up in — with my parents, sister, brother-in-law, nephew, brother and sister-in-law — all of us packed into my parents’ house, with one shower. You can imagine the engineering project that is coordinating bathroom time! But it was a wonderful week full of family time and lots of eating, drinking and playing lots and lots of games. My family is big on games — including the somewhat obscure card game called whist, that you’ve probably never heard of but we play ad nauseum when we’re together. That and Outburst, Password, cribbage, Yahtzee, Trivial Pursuit…you name it. Since my siblings and I all live elsewhere, my parents like to cook us all of our favorite meals when we converge back at Casa Whittemore. One of those is always my dad’s chicken chimichangas. He started cooking them with his guitar-playing friend Arthur back when I was growing up and they got together for jam sessions, and they’ve always been a stand-by. 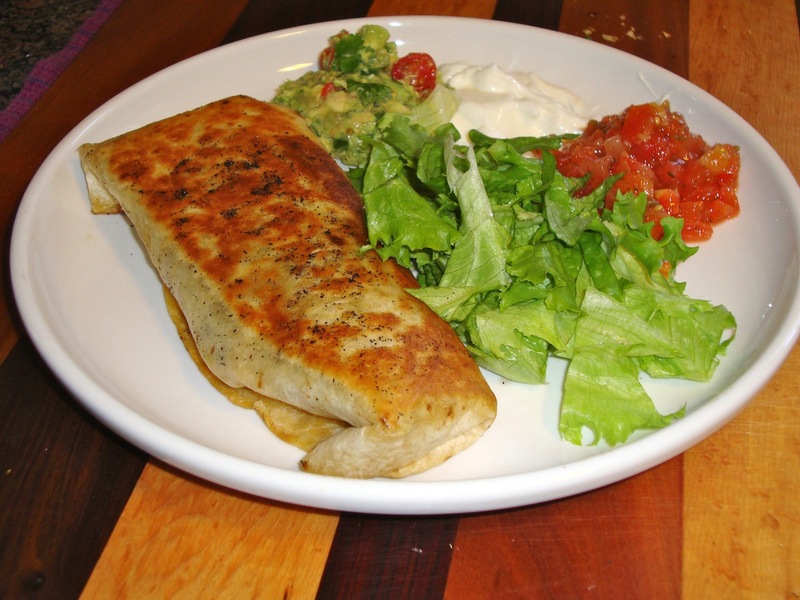 While traditional chimichangas are deep-fried, these are pan-fried, so you still get the crispy tortilla without so much fat. They’re spicy and full of cumin flavor, with melty cheese and crunch from the lettuce — I could eat them for every meal! I still don’t think mine are ever as good as my dad’s, but I make a valiant effort. Warning — the spice measurements here are approximate. My dad never measures. I did about a tablespoon of cumin and chili powder, and 1/2 tablespoon cayenne, and it was still pretty mild (for me). Next time I’ll go more aggressive with my spice. In a deep skillet over medium heat, add olive oil (about three times around the pan) and heat. Add about a teaspoon of each spice (cumin, chili powder, cayenne, curry) and toast for a minute or two. Add the sliced onion and peppers and a splash of juice from the jarred peppers if that’s what you’re using, or a splash of beer. Cook for a few minutes. Season the chicken with chili powder and salt and pepper. Add to the pan and saute to cook through. Add some more spices along the way, concentrating on the cumin and cayenne, to taste. When the chicken is cooked through, turn the pan down to low and heat a skillet over medium-high heat. Add olive oil and a dash of cumin to the skillet. Warm a tortilla in the microwave for 15 seconds and pile the chicken filling in the middle. Add shredded cheese and wrap up like a burrito. Add the wrapped tortilla to the skillet with the loose edge of the tortilla side down so it doesn’t unwrap. Brown on all sides in the hot skillet (it will cook fairly quickly). 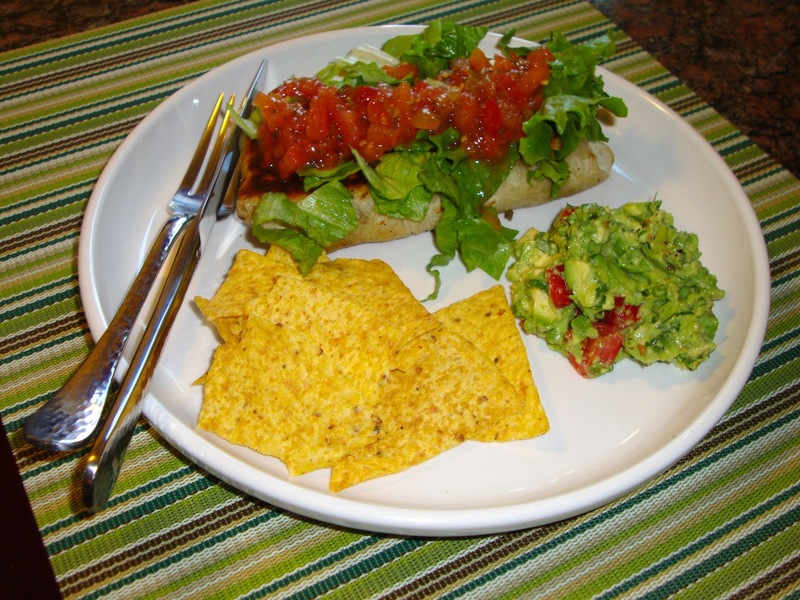 Serve with shredded lettuce, salsa, sour cream and guacamole. I have to confess — I got a little lazy on this one. Not only did I not realize I needed to marinate the chicken (I had to pull a quickie marinade together so I don’t think I got the full effect of the flavors that were possible here), but I just didn’t have the energy to roast the red peppers or fry said roasted red peppers for the crunchy topping. (Although I do think it would be good.) Sometimes a recipe is just too much, ya know? However, I’ve got to say that Guy Fieri’s Red Rocker Margarita Chicken Sandwich was still pretty tasty. 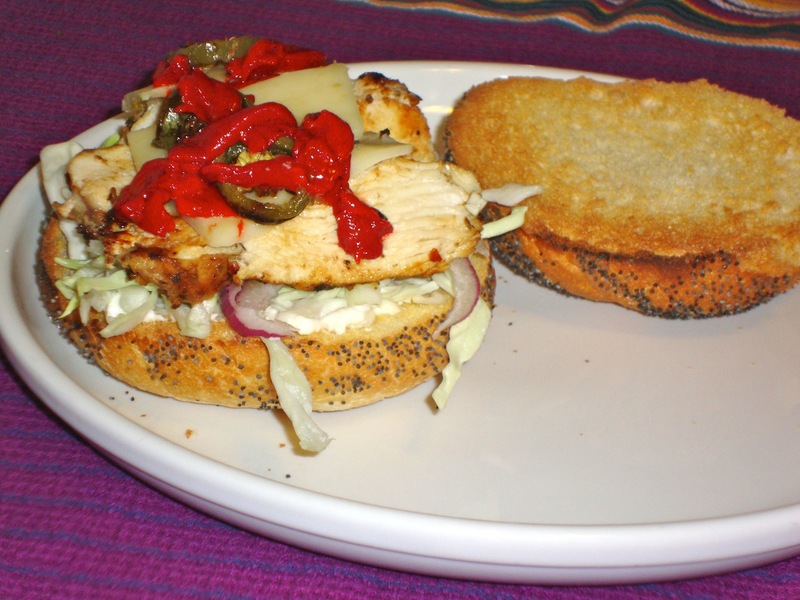 The chicken was nice and spicy, thanks in part to the fact that I added sliced jalapeno peppers to the skillet when I cooked the chicken, and I threw some of those on top of the chicken on the sandwich. That was some serious heat. And you really can’t go wrong with a sandwich. The cabbage slaw gave the sandwich a nice, fresh crunch, and with the cheese on top, it was nice and melty and a great combination of textures. Allow time to marinate the chicken. Duh. Find something good to make with the leftover cabbage — you’ll still have a lot left! If you get lazy like me, use jarred roasted red peppers, although I think roasting your own will make them hold together a bit better when you’re frying them. Use any kind of cheese you like — I prefer sharper/more pungent cheeses than provolone so I used cheddar. Pair this with a cooling salad or maybe even cucumbers with vinegar and dill for a nice acidic accompaniment. In a medium mixing bowl add jalapenos, cilantro, tequila, garlic, red chili flakes, cumin, oregano, lime juice, and 1 teaspoon salt. Add the chicken breasts and red bell peppers to resealable gallon bag and pour in marinade. Let marinate in refrigerator for 4 to 8 hours. Heat grill to high. Remove chicken from marinade, and add chicken to the grill. In a small mixing bowl add flour, remaining 1 teaspoon salt and the granulated garlic. Heat the canola oil to 350 degrees F.
Remove bell peppers from marinade and dredge in flour and fry until crispy. When done drain on paper towels. Cook chicken thoroughly on both sides, remove from heat and cover. Let sit for 5 minutes. Thinly slice or shred. Lightly toast rolls. 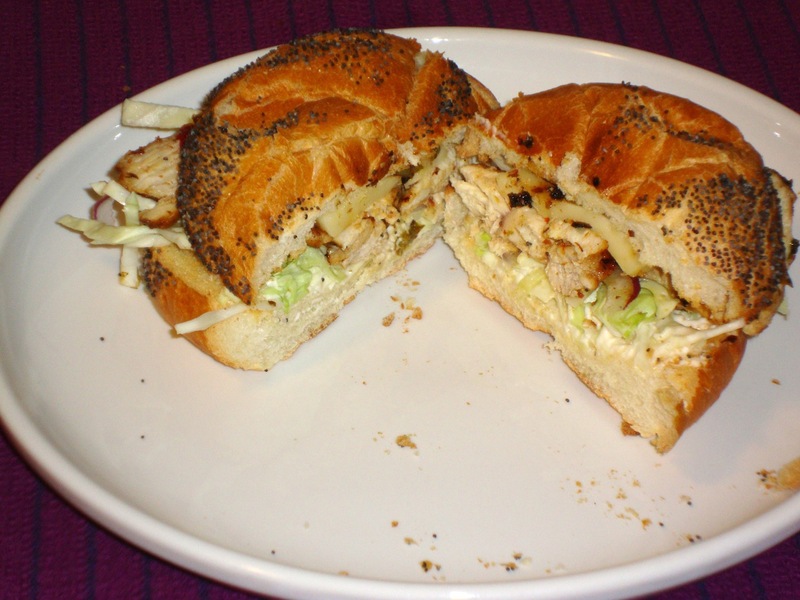 Spread mayonnaise evenly among the rolls and then stack evenly with the cabbage, onion, chicken breast, fried peppers, and top with cheese. I am highly (highly!) 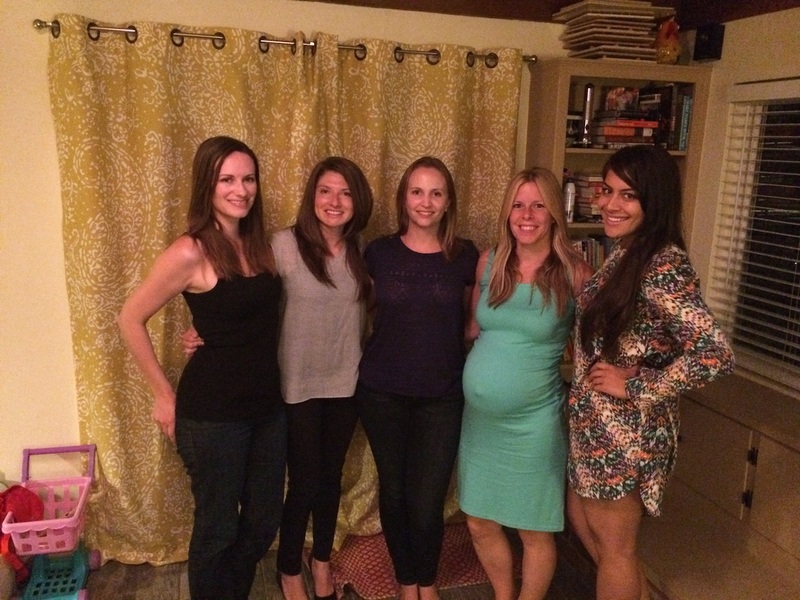 delinquent on this post — craziness with work plus a fun trip to the Grand Canyon interfered. I hate it when life gets in the way of my cooking! 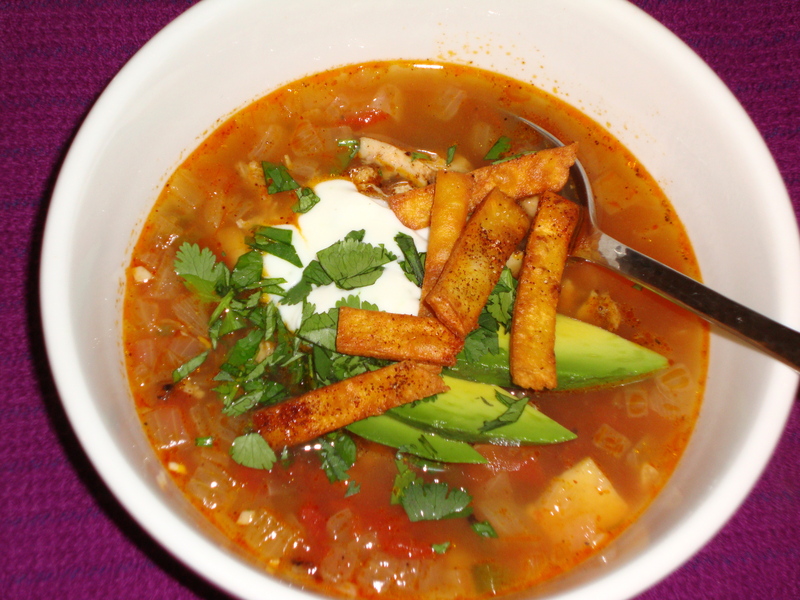 However, I redeem myself with this incredible recipe for chicken tortilla soup. This is a Guy Fieri and it’s super spicy but also really tangy, with some smoky flavor from the grilled chicken and an amazing, crunchy topper of homemade tortilla strips dusted with chili powder. Oh yes. Starting with the chicken — it’s marinated in a yummy combo of lime juice, tequila, adobo sauce, garlic and spices — it packs a punch. Note that you have to take the skin off the chicken if you don’t buy skinless — it’s relatively easy to do, but I forgot until AFTER it was in the marinade, which made the process rather messy, and not my favorite. Raw chicken is not my idea of fun. This is also not the easiest chicken to make since once it’s cooked you have to take it off the bone, but ya know what? It adds flavor, so it is what it is. If you’re not into it, try boneless skinless thighs and just shred the chicken. 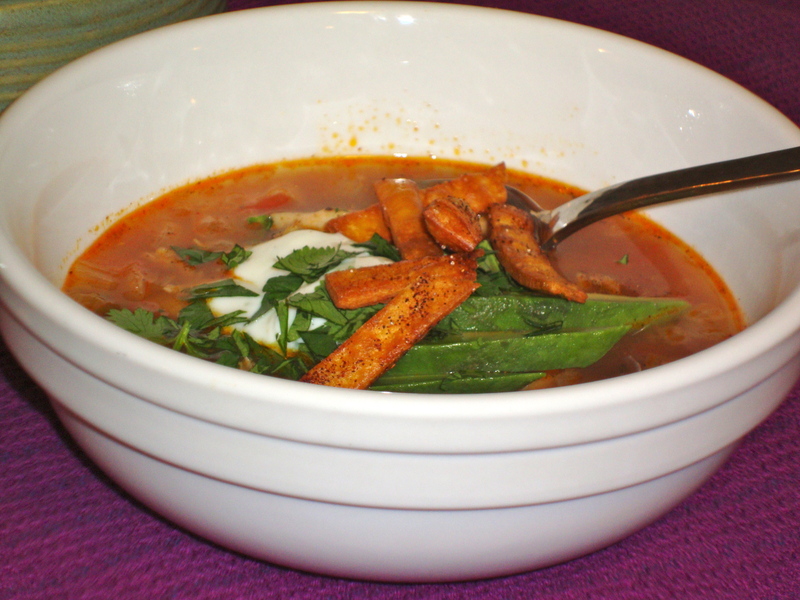 The soup itself is flavored with jalapeno pepper, onion, chili powder and cumin — simple but good. But it’s the toppings that really make this a winner…starting with sliced avocado, which will sell me on basically anything, and followed by tequila crema — sour cream spiked with tequila and lime zest, which gives a nice cooling effect. 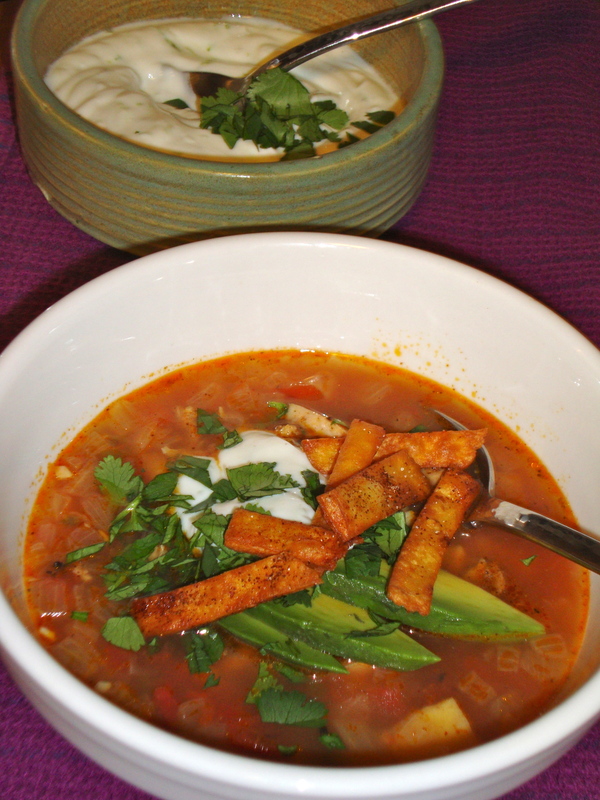 Add a squeeze of lime juice directly on the soup, and a sprinkling of cilantro…and finally, homemade fried tortilla strips. I admit up front, these are not the easiest to make, and your kitchen will smell like oil for a day or so. But there’s nothing like frying your own tortillas, and these make the perfect crunch on top. This is nothing like crumbled up tortilla chips — this is the real deal. The sliced tortilla Guy Fieri called for as part of the soup base was a little weird. I didn’t like it. I thought maybe it was supposed to thicken it a little, but that didn’t really work out. I’d skip trying to skin the jalapeno and just mince it after you char it — peeling the skin off never quite works, but the nice flavor from searing it is excellent. Remember you’ve got to marinate the chicken for 6-8 hours. 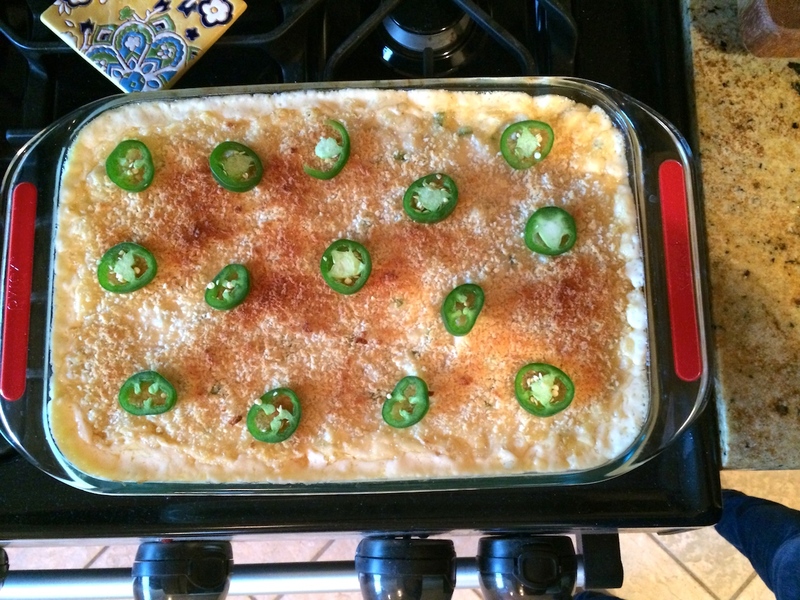 Serve with corn bread…or corn bread studded with jalapeno. Put the vegetable oil, tequila, lime juice, chipotle pepper, cumin, chili powder, garlic, oregano, salt, and pepper in a small food processor or blender and blend until smooth. Put the marinade in a plastic bag along with the chicken. Seal the bag and refrigerate for 6 to 8 hours. Preheat a grill or grill pan to medium-high heat. 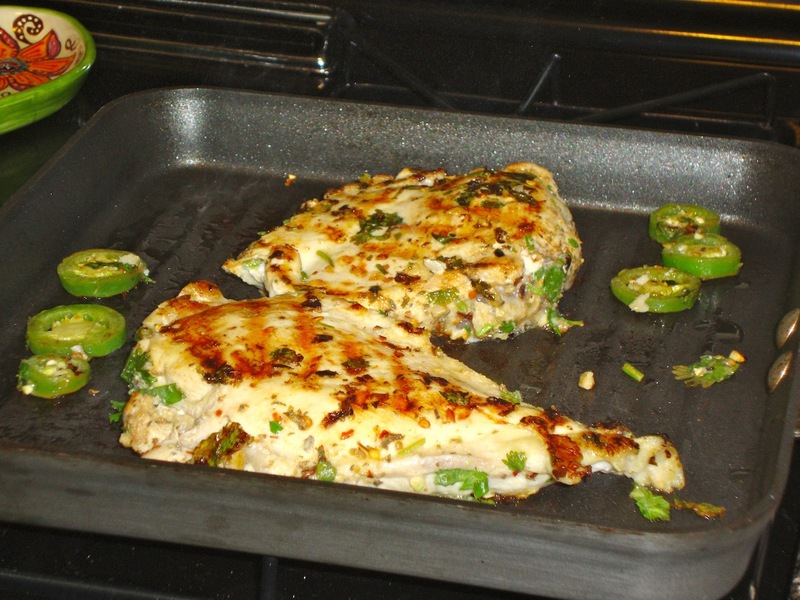 Add the jalapeno and grill until the skin is well charred. Remove the jalapeno to a small bowl and cover with plastic wrap to sweat the skin. When cool enough to handle, remove the stem, skin, and seeds, then finely mince. Heat a large, heavy bottom pot over medium-high heat and add 2 tablespoons of vegetable oil. Once hot, add the onion and saute until starting to caramelize, about 5 to 7 minutes. Add the garlic, minced jalapeno, chili powder, cumin, salt and pepper, to taste. Cook about 3 or 4 minutes, being careful not to burn the mixture. Deglaze the pan with some of the chicken stock, scraping up any brown bits from the bottom of the pan. Add the remaining chicken stock, the crushed tomatoes and the lime juice. 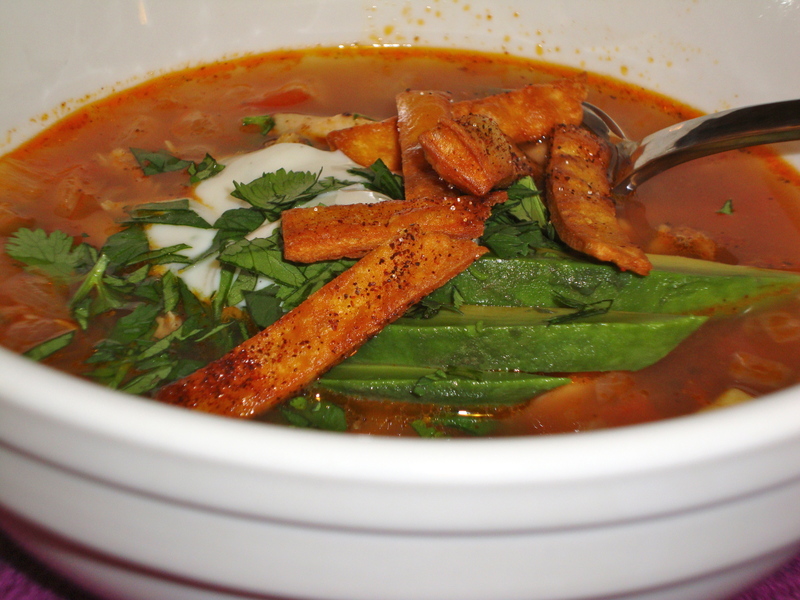 Add the tortilla strips and bring the mixture to a boil, then lower the heat and simmer, uncovered, for 30 minutes. Taste and adjust seasoning. While soup base is simmering, heat a grill or grill pan to medium-high heat. Remove the chicken from the marinade and put on grill. Grill, turning until cooked through, about 14 to 18 minutes. Remove from the grill, to a large plate and when cool enough to handle, remove the skin and bones and shred. Keep warm. Heat the vegetable oil in a tall sided skillet to 350 degrees F. Add the tortilla strips and fry until they are golden brown. 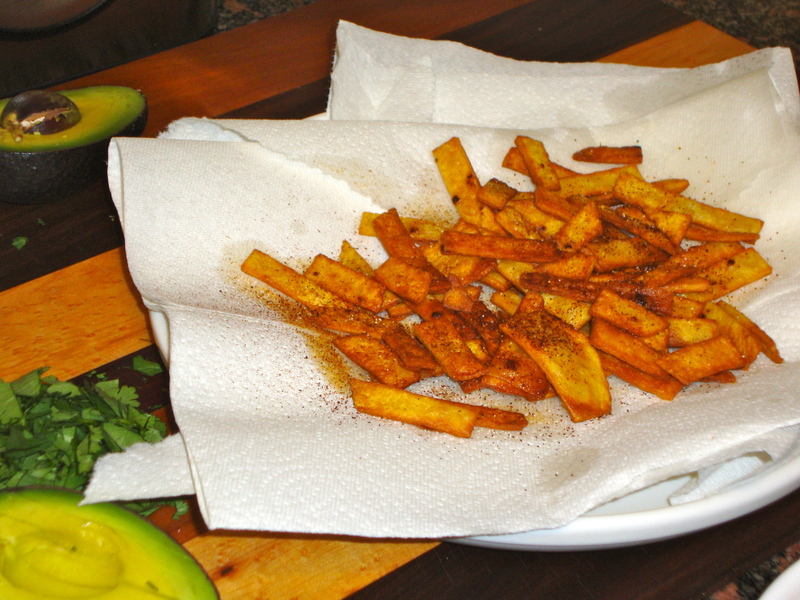 Remove to a paper towel lined plate and season with 1 teaspoon of salt and a pinch of chili powder. Combine the sour cream, 2 tablespoons tequila, and the remaining lime zest in a small bowl and season with salt and 1 teaspoon black pepper. To serve, put some of the shredded chicken in the bottom of each bowl and pour in the hot soup base. Top with diced avocado, fried tortilla strips, the tequila crema, and cilantro. Garnish with lime wedges and serve.